One of the most common problems faced by travelers at airport checkpoints is having to open their suitcases, handbag and even their laptop bag for inspection by the customs and immigration officers. Being asked to empty their carefully packed bags can be a nightmare. For the notebook-totting travelers, if you don’t want high-handed officers to disturb your laptop bag, one of the practical solutions to is to grab hold of the interesting Skooba Design Checkthrough bag. This “checkpoint-friendly” bag is designed particularly for travelers who value the convenience and want their bags to go through airport x-ray screening without having to remove the computer and other stuff inside the bag. 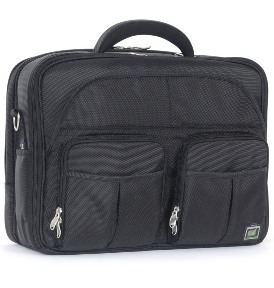 The bag has a special laptop compartment which is separated by a hinge in the middle. The laptop as well as the rest of the bag contents can be carried safely even with the hinge unzipped. The design of the bag offers the inspector a clear view of the laptop via a quick-recognition window. The bag which is sent for screening with the window facing up presents a clear view for the inspector, much as if the laptop were physically removed and placed in a bin for x-ray screening. Once the screening is over, travelers can zip back the hinge while on the go or waiting at the boarding gate. This saves time as travelers can prepare for the inspection process in advance. Of course a recalcitrant officer might still request for the contents of the bag to be removed but the checkpoint-friendly bag is designed to facilitate the screening and checking process for greater efficiency for all.